Did you know that Generation Y (Gen Y) prefers a hybrid mainstream sports car that seats 6? The graduate engineering students at Clemson University undertook a project to develop this ideal vehicle for Gen Y consumers. Members of Gen Y, also referred to as “Millennials”, were born between the early 1980s and the year 2000. Most are in their twenties and are just entering the workforce. As of 2012, there were approximately 80 million of them in the United States, making Gen Y a very significant age cohort. The Deep Orange Program at the Clemson University International Center for Automotive Research (CUICAR) consists of graduate engineering students, faculty, and sponsors that are focused upon designing and fabricating a new vehicle prototype over a period of two years. Each project applies innovative design processes and tools to vehicle development. CUICAR seeks to address industry and societal challenges related to the adoption of advanced automotive design technologies and product innovation. Deep Orange 3 is the 3rd-generation vehicle prototype designed and engineered by Clemson engineering graduate students in the program. Mazda North American Operations is the primary sponsor, along with design partner Art Center College of Design. Altair offers internship and fellowship opportunities for students and provides the HyperWorks® software suite as well as associated web-based training. The Deep Orange 3 vehicle features a load bearing structure based on an innovative sheet metal folding technology and a unique two-row 3+3 seating configuration package in a sports car architecture. This concept was developed drawing upon extensive market research to understand Gen Y vehicle preferences. A body-in-white (BIW) structural design concept was developed using Industrial Origami’s patented Folded Metal Technology (FMT). This technology enables the folding of lighter gauge material into complex shapes. Students used the simulation tools within the HyperWorks suite to ensure that the design met all structural design targets. Finite element analyses were conducted to understand torsional and bending stiffness, natural frequency, and dynamic pot-hole and bump loads. 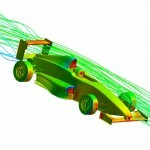 Simulation results indicated that the BIW chassis either met or exceeded strength and stiffness requirements. “Altair HyperWorks was the most useful tool for enabling our Deep Orange 3 body structures team to meet our BIW stiffness and strength design targets,” noted Dr. Imtiaz Haque, Executive Director of CUICAR. The primary supplier of the program performed all the construction on the vehicle. The complete FMT BIW design was built using aluminum and structural adhesives, and includes the unique 3+3 seating configuration as well as an instrument panel, steering wheel, and driver controls. What an exciting ride for the graduate engineering students at Clemson University! Deep Orange 3 vehicle was successfully exhibited at the 2013 Specialty Equipment Marketing Association (SEMA) show last November in Las Vegas, Nevada. Best wishes to all the graduates of the Deep Orange 3 program! Did You Know that you can use a user defined function in AcuProbe to plot computed quantities?